The house is located 50 meters from a very long and large seaside of white sand. This very silent house has two sleeping rooms, one with a double beds and the second one with bunk bed, a large living room with 2 day beds, a small but fully equipped kitchen, a bathroom, a large patio, an open space with private terrace garden with typical Mediterranean trees all surrounded by a huge garden. This house can accommodate up to 6 people, 2 in the main bedroom, two in the room with bunk bed, two in the living. The living is equipped with a table for up 6 people, a second table is located in the patio. The bathroom is equipped with toilet, bidet and a large shower to relax after a long day at the seaside. The small kitchen is fully equipped for all meals and has a large refrigerator and a dishwashing machine. Bed and bathroom towels can be supplied at premium if required. 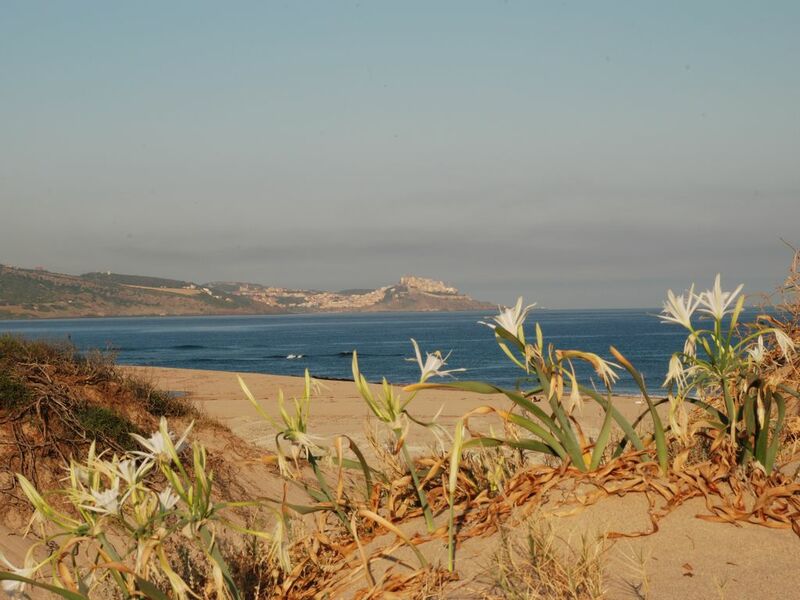 The house located on on the north coast of Sardinia close to the village of Badesi (11 km) and Valledoria (9 km) inside the touristic village named "Mimosa Bay" and confines with a natural park. The touristic village in the period mid June-mid September has a bar, a restaurant, a small supermarket and a group of young people That organize games for kids and adults and evening events in the theater. The house is located remote from the theater, so you can participate on to the events without the inconvenience of the noise. There is Also a sports center with 3 tennis courts, two swimming pools (one 50 * 25 m and one for kids), a basket ball court and mini golf. Access to the sports center is at premium. The house located on on the north coast of Sardinia close to the village of Badesi (11 km) and Valledoria (9 km) inside the touristic village named "Mimosa Bay" and confines with a natural park. The touristic village in the period mid June-mid September has a bar, a restaurant, a small supermarket and a group of young people That organize games for kids and adults and evening events in the theater. The house is located remote from the theater, so you can participate on to the events without the inconvenience of the noise. There is Also a sports center with 3 tennis courts, two swimming pools (one 50 * 25 m and one for kids), a basket ball court and mini golf. Access to the sports center is at premium.